The Golds Gym Whey Protein - 800g is a quality sports nutrition supplement created for anyone looking to build and maintain lean muscle mass. Protein is such a versatile supplement - it can be used before, during or after training to great effect. It is perfect for breakfast time, or any other meal where you're looking to boost protein consumption. Alternatively, Gold's Gym Whey Protein can be used as a healthy, low carbonate, low fat, high protein snack between meals. Or, it can simply be used directly after training to increase recovery and aid muscle building, or directly before bedtime to prevent the muscle loss that would normally occur during the night. A high quality source of protein, like that found in protein whey, will break down into amino acids, which can be used by the body for a variety of functions, such as repairing tissues, supporting the immune system, producing hormones and building muscle. And this is only the tip of the iceberg - protein really is vital, so it's necessary that you get your nutritional requirements in check. That's why anyone looking to build and maintain serious lean muscle mass must invest in a quality protein whey if they would like to see positive results. Gold's Gym Whey Protein is a quality supplement, guaranteed to promote effective, fast lean muscle gains. Of particular importance are the Branch Chain Amino Acids (BCAAs) which play a significant role in muscle formation and maintenance. Each serving of Gold's Gym Whey Protein contains over 7.2g of these BCAAs, so you can rest assured your body is getting exactly what it needs, when it needs it. For best results, consume every 2-3 hours with milk or water. Produces a positive nitrogen balance, promote muscle growth, repair and recovery. Allergy advice - contains a source of soya and milk.The product isHFL tested, and suitable for vegetarians, coeliacs and diabetics. 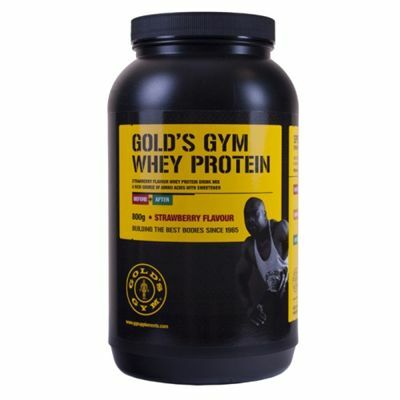 for submitting product review about Golds Gym Whey Protein 800g.